I had been anticipating the release of Little Big Planet for PS3 at least a year before it even hit shelves. The glorious day finally came, I hoped in my buggy and headed to my local Target in hopes of obtaining a copy. I had it in my hands, literately in my hands, and would you believe the guy behind the counter wouldn’t sell it to me. I wanted to call shenanigan’s, I wanted to have him put away, arrested, beat up in the parking lot. How dare he tell me I couldn’t have it. For a hot moment I thought maybe I should make a run for the door, escape with my copy of Little Big Planet for PS3. Steal it. After frantically searching online for an answer, I discovered that Little Big Planet for PS3 was being banned for some ridiculous commotion of lyrics. I thought about buying a dirty copy of Little Big Planet for PS3 from Amazon, but the game normally would sell for $60.00, and these greedy clowns were selling the original ultra rare banned copies for close to $200.00. I love games, but heck no. I could buy myself another Nintendo Wii for that price! The day though did finally come when I finally could get Little Big Planet for PS3. A month late, but finally I had my game. The built up anticipation nearly made me puke. I had to literately wait a few hours before even playing it, because it was too much for my mind to handle at the moment. A mini world of my own; to live, create, play, build. Once I started the game up I became mesmerized with my Sackboy. He’s your character, and he is an adorable little voodoo doll like creature, so adorable that you will want to reach into your TV and pull him out to give him big cuddly hugs. The introduction in Little Big Planet for PS3 was most weird, and frankly the most unique introduction to a game I’d ever experienced. I steered my sackboy through a straight side scrolling path; the path however was filled with all sorts of quirky objects, pictures, stickers, and Toto, we definitely are not in Kansas anymore. Things here in this Little Big Planet for PS3 are definitely different. I have to give major kudos to the team of game developers who came up with this one, they are truly one of a kind. Objects looked so realistic, environments so rich with color, oddity, and if you were like me, and believed in ‘little people’ as a kid, this game will totally give you that sense of being temporarily dropped off into a world where you are one with the little people; invading their world, peeking into it and enjoying every second of it. A world where thimbles are chairs, sewing spools are tables, forks and knives become slides for unique mini playgrounds, balloons become rides into the sky, matchbox cars become fully accessible and use-able cars, and if that does not excite you, you can make something of your own. Anything of your own! The plot of Little Big Planet for PS3 is relatively simple. There is something lurking in Little Big Planet that keeps on kidnapping level bosses, and it is up to you to complete each of the levels while saving the bosses. The games plot though is not what makes Little Big Planet for PS3 so deliciously addicting, it is the content hidden within each level that you will be after. The stickers, the toys, the objects, the clothing! Who cares about saving a level boss anyway!? I want to find the hidden army outfit in Little Big Planet for PS3. Basically that is what each level in Little Big Planet for PS3 presents. You’re not going to run through each level looking to quickly make it to the end and save the day. You are going to want to search every single nook and cranny to find the hidden goods! 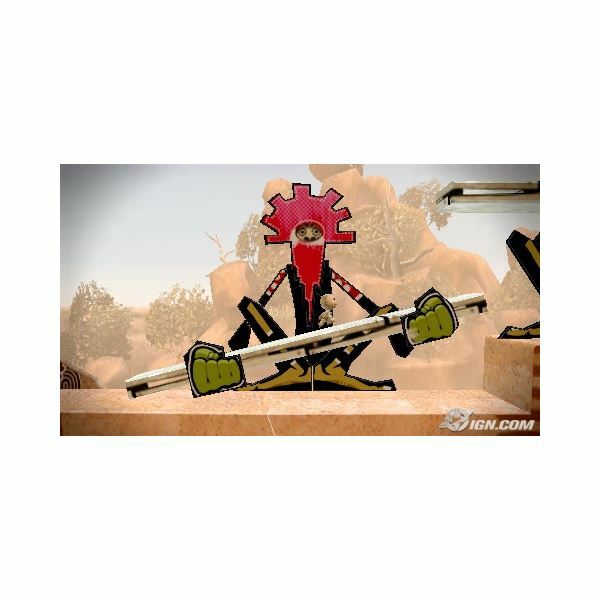 These objects can be used to create your own one of a kind unique level to share with other online Little Big Planet for PS3 players. You will travel through many levels, with many different themes such as snowy levels, jungle levels, sandy levels, racing levels, and so much more. Travel through the city and find hidden graffiti stickers, travel through the snow and pick up new musical themes for use in your own custom created level. All of the levels are quick, fun, and entertaining, which help make Little Big Planet for PS3 one truly unique gem. Creating my own levels in Little Big Planet for PS3 is by far the funnest thing about LBP. Although the playable in-game levels are spectacular, you would be simply jaw dropped amazed at the levels that some other fellow Little Big Planet gamers are capable of creating. I played a level where a gamer seriously re-created an entire level that old school gamers will remember come from the original Sonic the Hedgehog game. A level of Little Big Planet for PS3 that was created with an entire Star Wars theme, levels with Mario brother themes, so truly some of the online levels you will come across are nothing short of art, talent, and sheer genius. One of my favorite movies is Labyrinth, so naturally one of my custom created levels in Little Big Planet for PS3 is decked out to resemble that movie. I was able to form the Goblin King out of cardboard, bolts, and nails. I was able to create the goblins, the castle, the pit of eternal stench with farting rocks and all. The best thing about it though was that everything in my level was done my way! More time is honestly spent on creating your own levels in Little Big Planet for PS3 than actual gaming. Gaming is a lot of fun, but if you are more into creating, you will spend most of your time building levels, waiting for people from all over the world to rate and comment on your level after playing it in Little Big Planet for PS3. ***NOTE: Playing Little Big Planet for PS3 with friends at home is fun, but one thing you will definitely need to note is that this game will absolutely NOT work if you do not have an official Sixaxis controller. We used a cheaper Logitech controller and it would not recognize it. I learned online in forums that the game strangely will only work with the proper controller! So boys and girls make note of that, otherwise you’ll be disappointed. Anyhow, with that said, playing online in Little Big Planet for PS3 can go both ways. It can be fun, and annoying at the same time. Some players will weigh you down causing you to have to wait for them to catch up in Little Big Planet for PS3. If they get stuck, you too are stuck and will not be able to move any further unless they die, or drop out. I have also read complaints that if you team up with other players whom have a slower network connection will cause glitches in the game-play for Little Big Planet for PS3. This however has never been my experience with the game itself. Little Big Planet for PS3 for me has always run flawlessly, no glitches included. Either I personally have been really lucky, or the people stating this are the ones with the cruddy connection; not the other way around. In order to play Little Big Planet for PS3 with other players online for multi-player gaming you are going to need a headset for communicating, or a PS3 Eye. I bought the PS3 Eye specifically for this game (The PS3 Eye though will be an entirely different review for another day). To simply put it though, it allows you to communicate with other players in Little Big Planet for PS3 (and other games) without having to wear an annoying headset. The PS3 Eye can also be used to create custom stickers for use within the custom level creation. 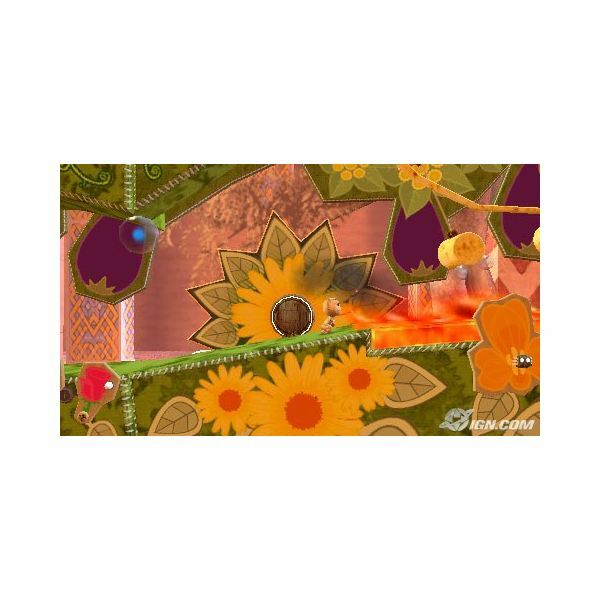 You’re lovely face on a sticker that you placed on a wall in your level of Little Big Planet for PS3. Basically your level will be played by thousands of others, they will all get a chance to take a look at your gorgeous face as they make their way through your level! Haha! It’s not necessary, but having the PS3 Eye with Little Big Planet for PS3 is pretty cool, and adds a feature that you would not have otherwise. All in all, Little Big Planet for PS3 would not be the same without Multi-player being added to it. And, online play would also be totally pointless without having Multi-Player incorporated into it. The re-play value on each level, and Little Big Planet for PS3 overall, is enormous because there are some areas that can only be accessed with 2 players, or 4 players. You will continuously be going back to played levels to retrieve objects you missed the first few times. After you complete a level in Little Big Planet for PS3, the games on screen report will tell you what percentage of the items you have collected. If you have completed the level with collecting all 100% of objects you won’t have to re-play the level. You will not be able to complete a level in Little Big Planet for PS3 on the first try though, not by a long shot – but don’t feel bad. The controls in Little Big Planet for PS3 are easily understood in the very beginning of the game. But, there are so many different commands and controls in Little Big Planet for PS3 that you will be working with when making your own levels that is gets frustrating at times. 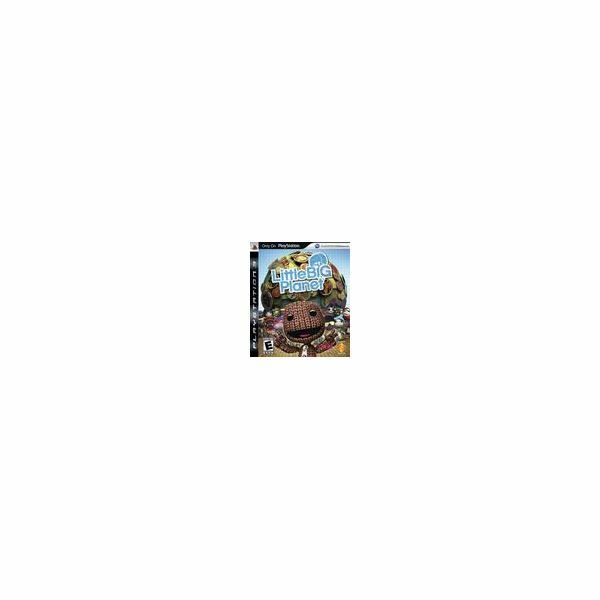 Little Big Planet for PS3, as I stated is a side scrolling platform. However the game has depth, and there are 3 levels of depth. This is necessary to give off that gnarly 3D effect that makes the game so visually stunning. While building things in Little Big Planet for PS3 though, the 3 depth levels can sometimes get in the way of building things properly in the same plane. Say you wanted to place a foam cloud on top of a cardboard box in the shape of a pyramid (just an example of something odd I would create). The cloud would fall to the ground if you did not place it in the same depth plane that the pyramid was made on. I mean it is not really a big deal having to pick the cloud back up to fix it, but it does get annoying at times, because it will happen often in Little Big Planet for PS3. The controls in Little Big Planet for PS3 are quirky, not flawed. There is a difference. Once you get the hang of the controls in Little Big Planet for PS3 though, you will be building all sorts of bizarre oddities such as trees with swinging arms, or flying fish that fall from clouds when you walk by, maybe a rocket ship that will take players into your custom made alien orbit, or a icy cold land filled with ice and sleigh rides. It’s entirely up to you, and you can build it if you can think it in Little Big Planet for PS3. There are no restrictions. Little Big Planet for PS3 is by far one of the most unique games I have ever played. Although creating my own levels is time consuming, it is the funnest thing that developers could have included. They could have simply skipped out on it by only giving us the in game play, yet they added this whole other aspect in gaming that is truly a diamond in the rough. So, for anyone considering picking up another game for their Playstation 3, Little Big Planet for PS3 is the way to go.